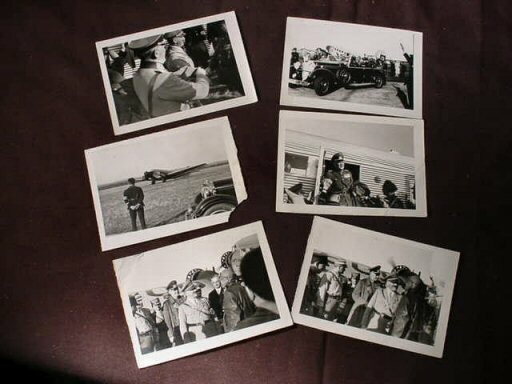 DESCRIPTION: This is an amazing group or original pictures that document an official visit of Adolf Hitler and his entourage to some unfortunately unidentified location in Germany. 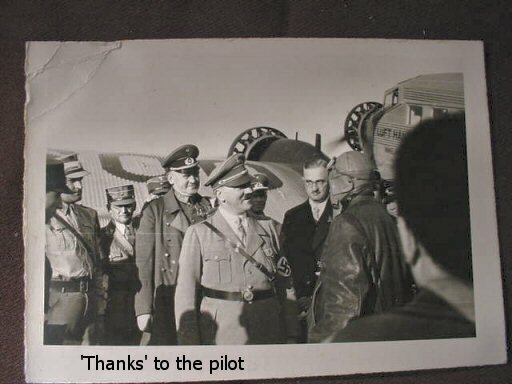 There are 40 pictures in the group and they are, I’m sure unpublished anywhere. 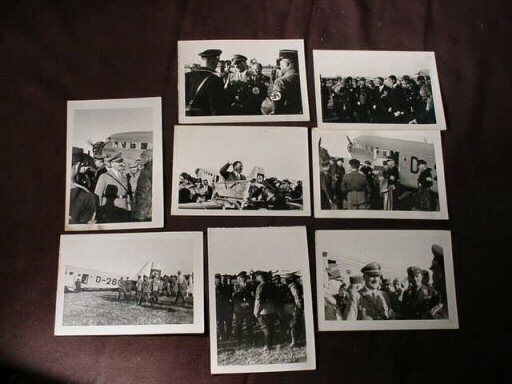 From the look o the backs of the pictures it appear as if they must have at one time been in an album. 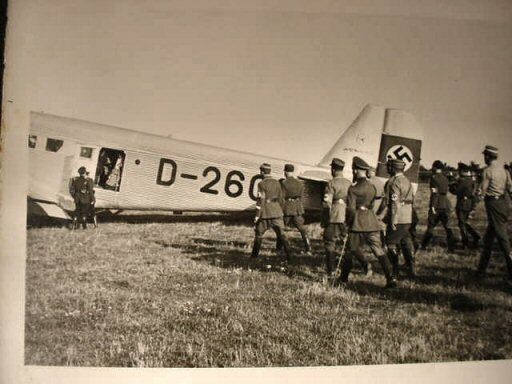 The action takes place entirely on an airfield as Hitler arrives in the corrugated-side Junkers aircraft. 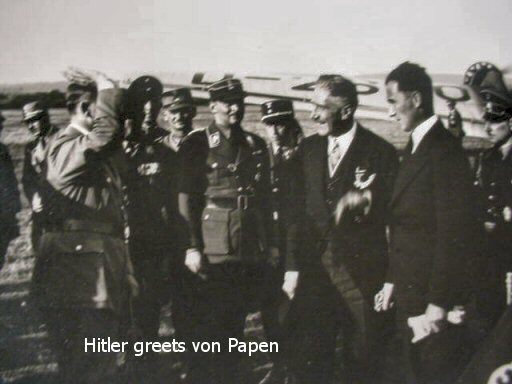 With Hitler are Franz von Papen, his deputy chancellor in 1933 and 1934, and Ambassador to Austria later in 1934. 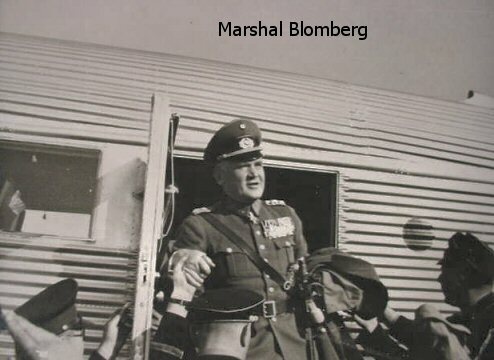 Also accompanying Hitler are General Field Marshal Werner von Blomberg, Minister of War and commander of Germany’s armed forces until 1938, who, unfortunately, was sacked because of an affair and unfortunate marriage to a lady who had some serious baggage, which incensed the Führer to dismiss him. This was very unfortunate because the field marshal was certainly an exceptional staff officer and a recipient of the Pour le Mérite in WWI. 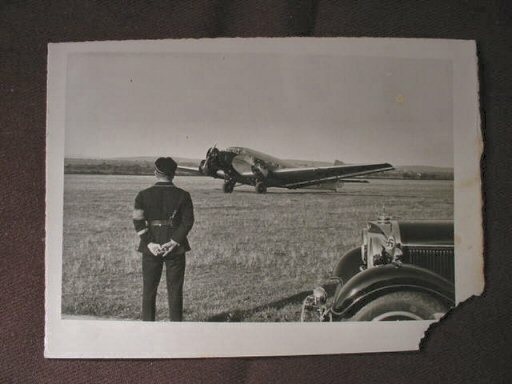 The pictures all measure 5 x 3 1/2 inches and with the exception of one or two that might have a crease or a corner broken off, they are in marvelous, pristine condition. 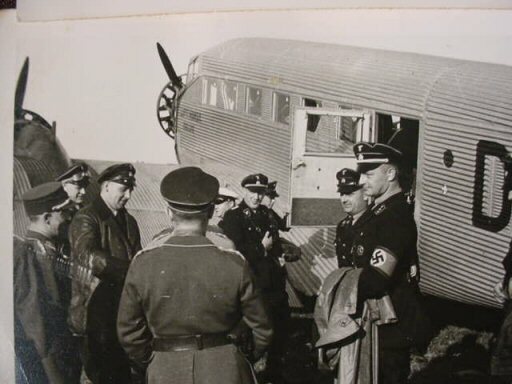 In one of them Ernst Rhome, the SA leader, is seen reviewing his brown battalions. 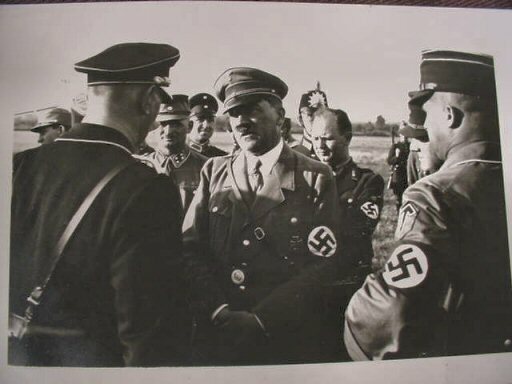 At least 13 of the pictures show the leaders and the Führer, while the others are of assembled unidentified political leaders, police, SA, SS, dignitaries, etc. 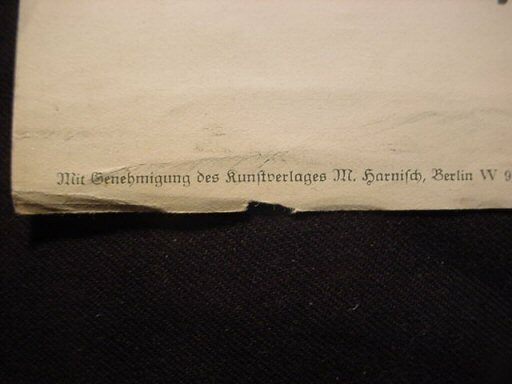 This is one very fascinating and important archival grouping. It is absolutely original and quite candid and a treasury of unpublished photos never before seen. 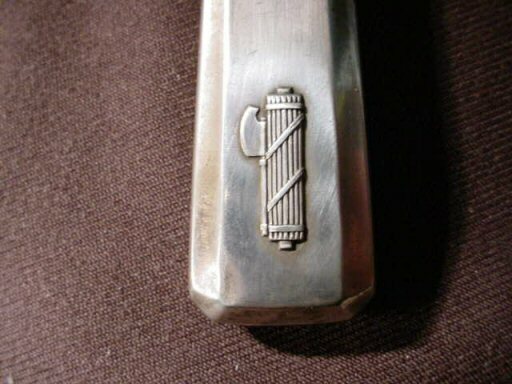 DESCRIPTION: This is a grand piece of Wellner table service—a dinner knife in the traditional German style with the fasces of Rome raised in high relief on the handle. 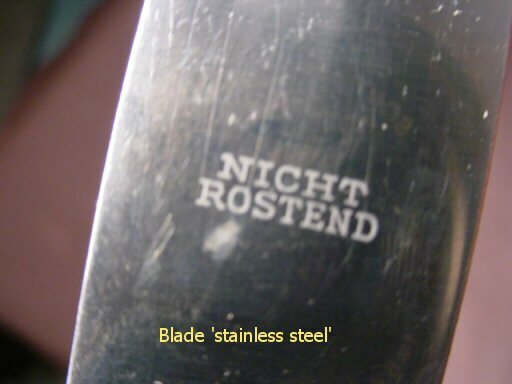 It has the crown moon and ‘800’ along with the Imperial-style eagle stamped at the top of the grip on the blade (Nicht Rostend), “stainless.” This is a very historic piece made by the same silversmiths that made the silverware for Adolf Hitler. 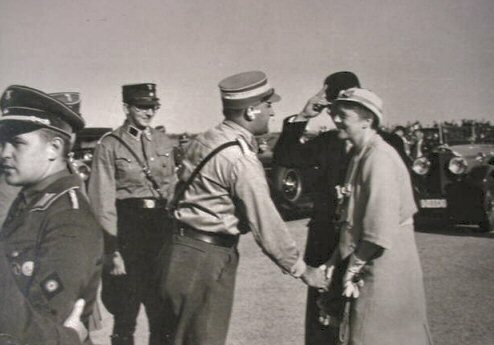 The purpose of this was to honor the guests among the high dignitaries who visited Germany and the NS leaders. 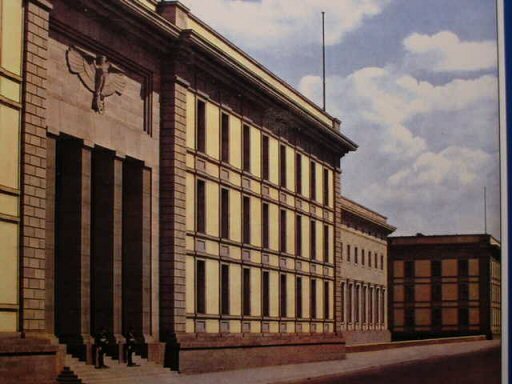 The set of Italian service was kept in the Führerbau in the Königsplatz in Munich. 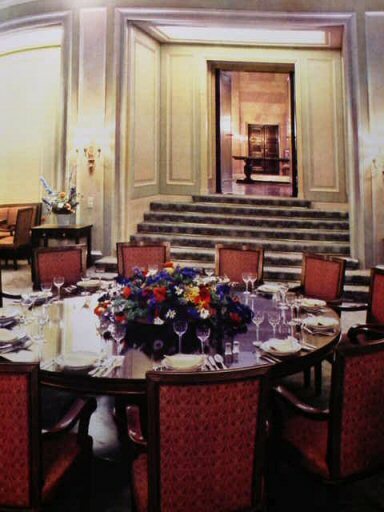 This is where the most important guests to the Führer and party had their diplomatic meetings. 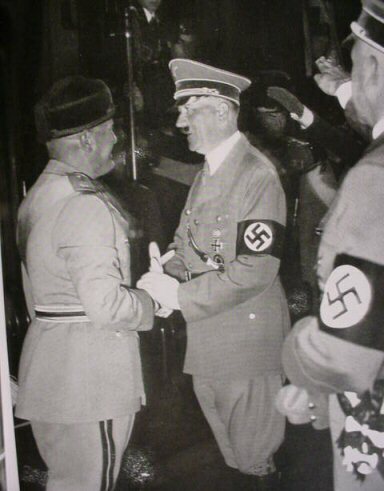 Here is where Hitler met with Britain’s Neville Chamberlain and Italy’s Benito Mussolini for the famous Munich conference of September 29, 1938. This was actually a four-power conference with Edouard Daladie of France having a little bit of a say, also. 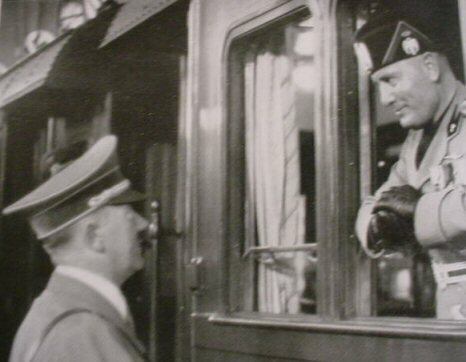 Many Italian dignitaries, including Count Ciano Mussolini’s son-in-law and chief of the Italian press corps and Undersecretary of State for Press and Propaganda (1934) also met there. 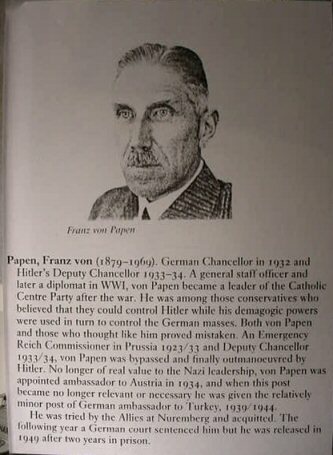 He was also a highly placed member of the Fascist Grand Council. 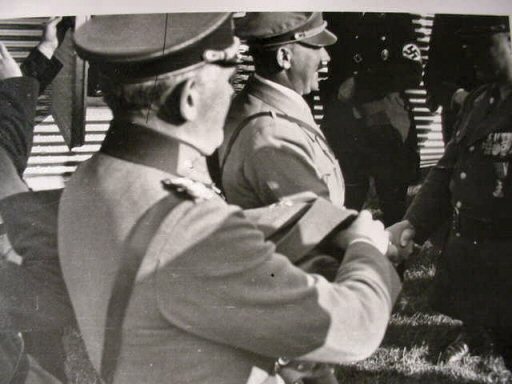 Many other Italian leaders of military and political fame visited the Führerbau and it was for this reason that the Italienischer Abendessensatz was created. This set of Besteck, or dinnerware, was brought out only when some of these honored guests and allies were present for dinner, and this is the one and only piece of this exceedingly rare set that we have ever seen or been able to acquire. 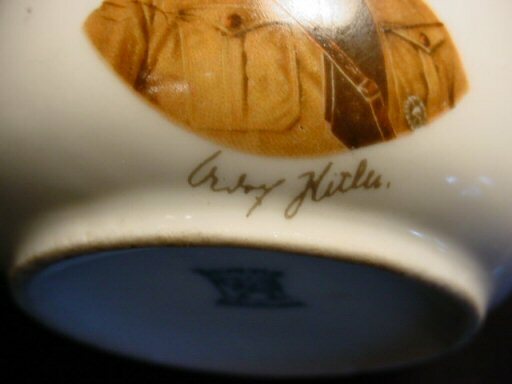 It is much rarer by far than the Hitler silverware for the fact that the Führer’s sets numbered many groupings at the Reichs’ Chancery, the Berghof, the Prinzregentplatz apartment, the Brown house, and dozens of hotels that he frequented during the era of the Reich, but this set was to be found in only one place and that was in Munich’s Führerbau and there only. So in comparison with the prices brought for AH silverware today, the price we set on this very rare relic cannot seem too bad at all. DESCRIPTION: Wow! 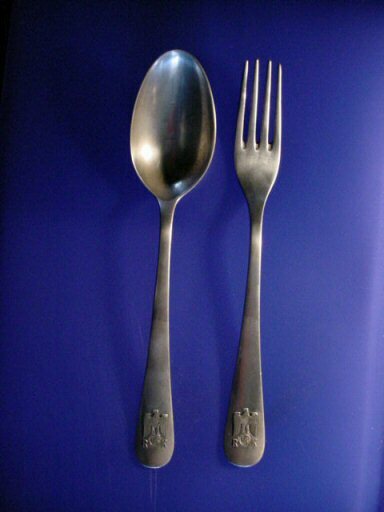 Here is a spoon and fork from the Führer’s Berlin chancellery. 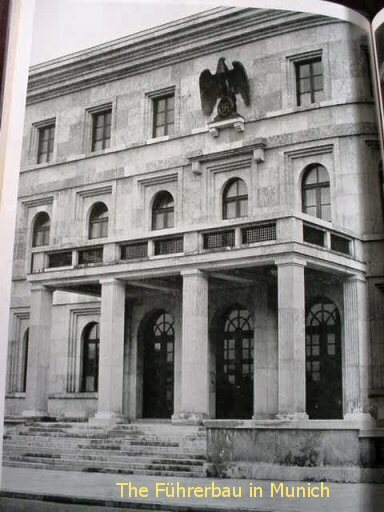 This Neureichskanzlei was the building where all the most important state affairs were conducted. 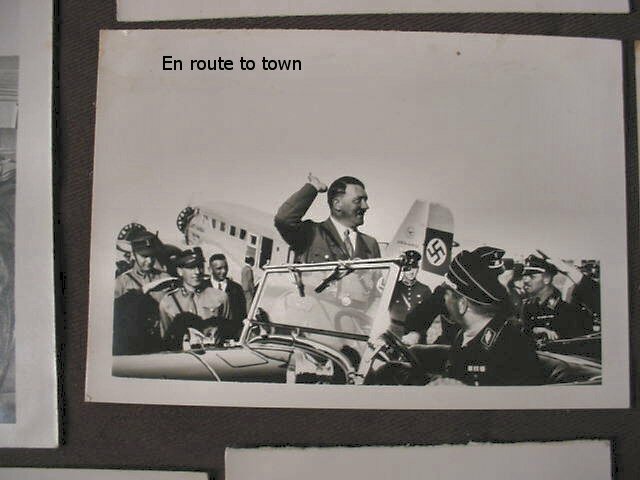 It was the official building for Adolf Hitler. It was also one of his official residences. The building was truly a masterpiece of colossal architecture. 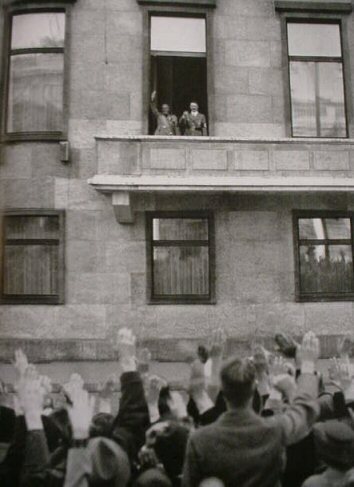 Albert Speer, the greatest of the Third Reich builders, and Hitler’s personal state architect, turned over the finished building on January 9, 1939. No building before or hence could compare to it for sheer beauty and utter magnificence. 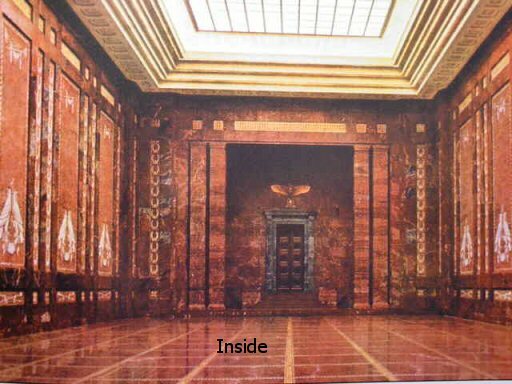 The master plan of the new Reich’s Chancellery was best felt by experiencing the room-to-room sequence. A tension-rich change took place at pleasant intervals; each room is completely individual in concept, yet all the rooms were linked by a close relationship and made fascinating by their individual paradoxes. 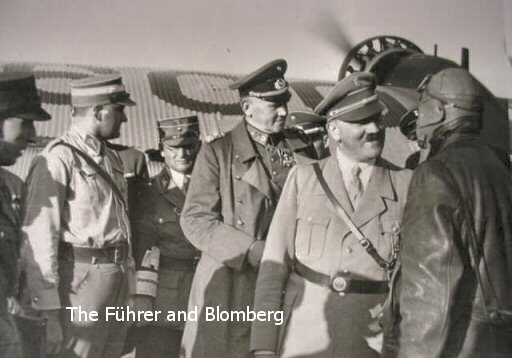 They all perfectly served the concept of leading the visitor step by step to the Führer of the German people and the leader of the greater German Reich, in a dignified manner. The visitor was easily compelled as he goes to change his gait from strolling or walking to pacing and finally to a strut. 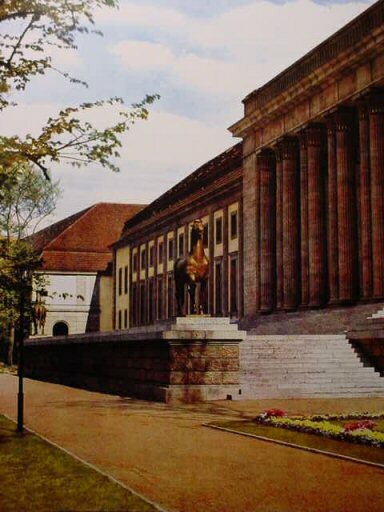 This building was the technical rebirth of German majesty and Teutonic grandeur. The scale used to build the grand old castles was exceeded, not in splendor or special extension, but by an obviously more comprehensive spiritual attitude. 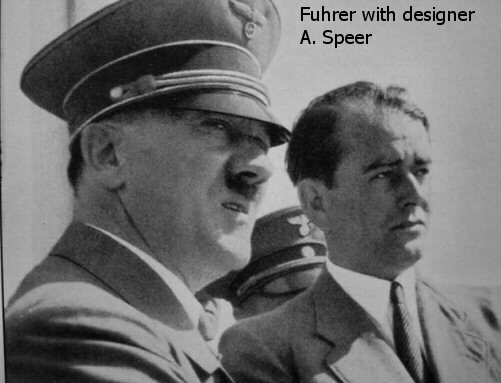 Speer was the builder, but the Führer himself was the ultimate designer. 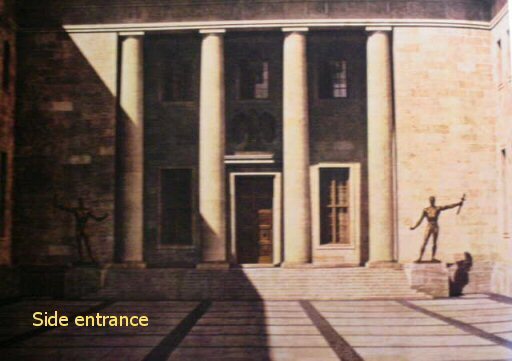 Even stronger than the powerful façade of the new Reich’s Chancellery were the inner parts which exuded power and greatness and had definitely been birthed by a strong, self-confident era..? 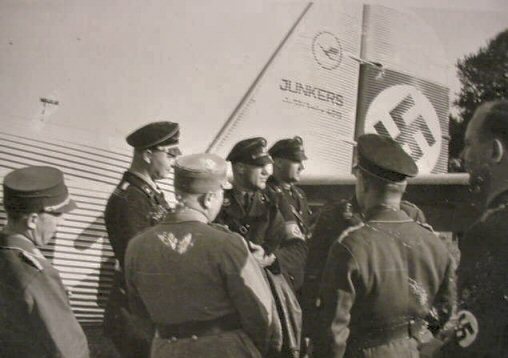 See the pictures of the Führer’s personal office and the actual candlesticks that we have. See Item AH 11-1. 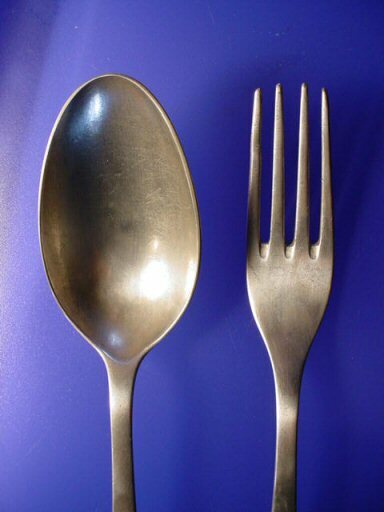 The silver dinnerware pieces we offer were the official Besteck, or flatware, from the Kanzlei. 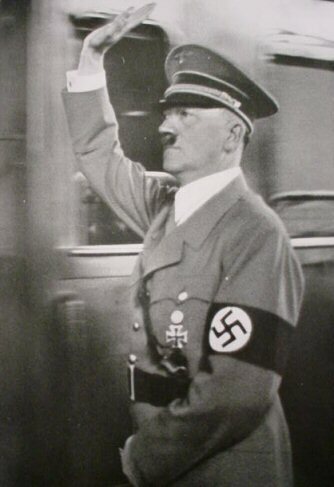 The Adolf Hitler formal-pattern silverware was used only when the Führer was to attend a dinner or luncheon personally. 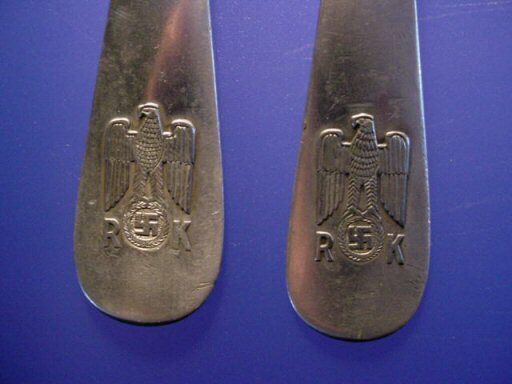 Otherwise, guests used the Reich’s Chancellery silverware. 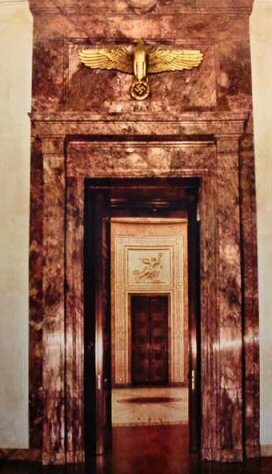 It’s far more scarce than the A.H. pieces since it was used only here, while the formal pattern with the familiar Hitler eagle, ‘A.H.,’ and Greek key pattern were used in several of his residences and was produced in the thousands. 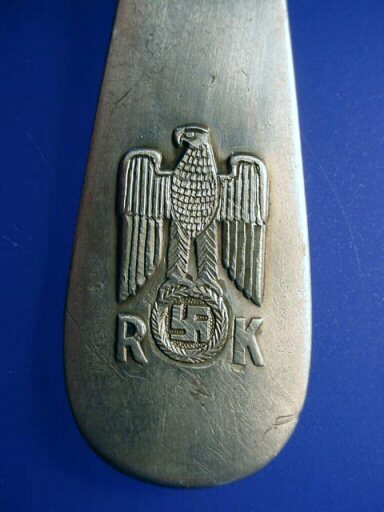 While it is said the R.K. pattern was used here, only Mussolini, Ciano, Chamberlain, Göring, Goebbels, and Himmler used this flatware when the Führer himself was not seated. 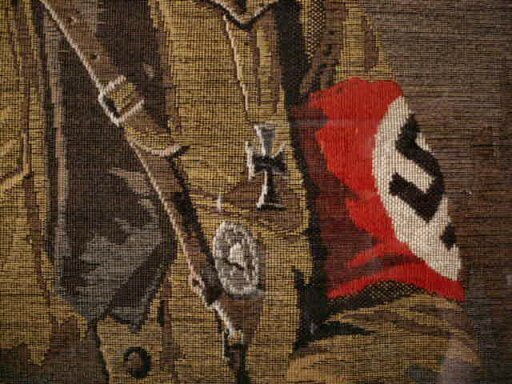 This pattern almost never shows up probably one to a hundred of the A.H. formal patterns They are nowhere near as fine, but so much more scarce than the Führer’s personal pieces. The eagle pattern is similar between them but different. 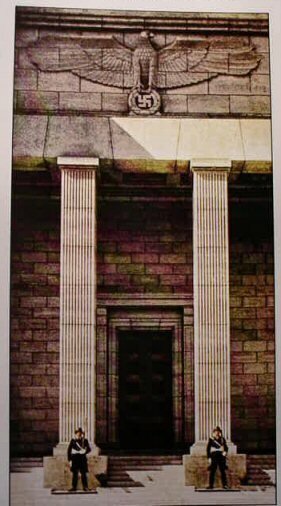 The eagles are actually finer in detail, but the absence of the Greek-key design makes the rest of the pieces rather plain. 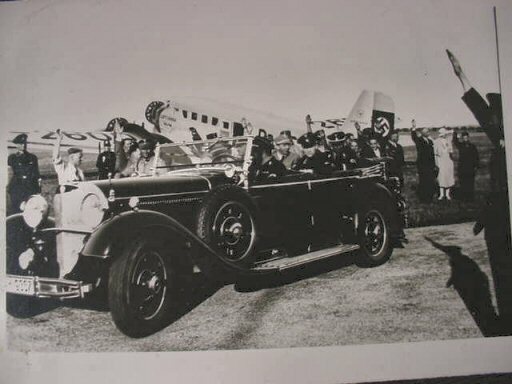 We are sure that this was purposeful so that the Führer’s Besteck would shine gloriously on the gala table when the German leader was present. 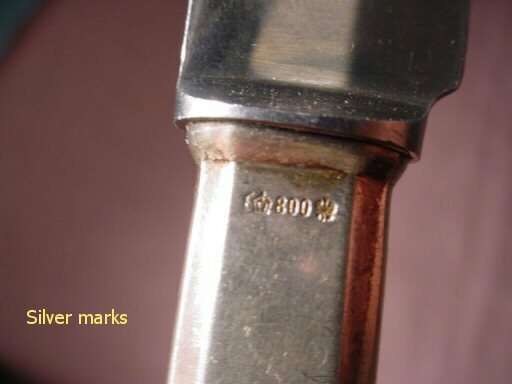 The pieces are in ‘800’ silver (so marked). Also, the crown, the half moon, and Imperial-looking eagle are to be noted on each piece. 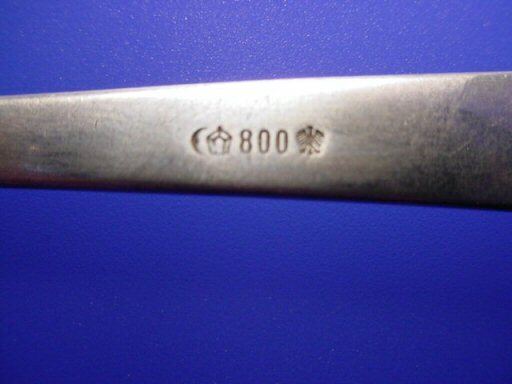 Wellner may well have produced them while the formal pattern A.H. flatware was by Bruckmann. These are the dinner sized: 8 1/4 inches long. They show use, but are in extremely good condition. They are very historically important museum pieces. We prefer to sell them together. 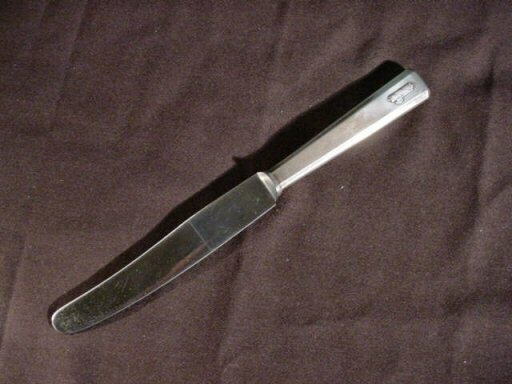 DESCRIPTION: Here is a great, little piece of original Kitch. 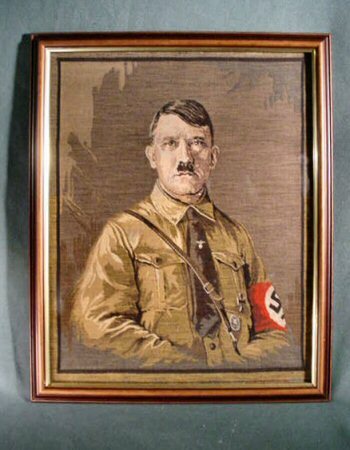 After the election of Adolf Hitler in 1933, the German specialty shops throughout the Reich abounded with items with the graven image of the Führer. 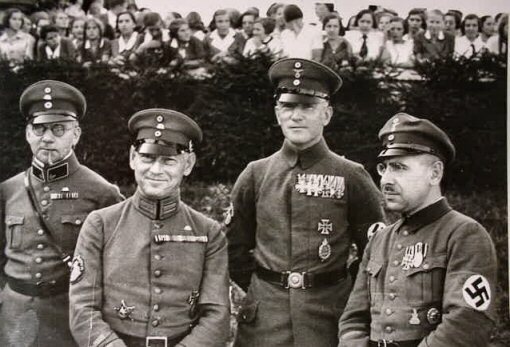 Most of them still showed him in the brown-shirt uniform of the Kampfzeit (the struggle for power). 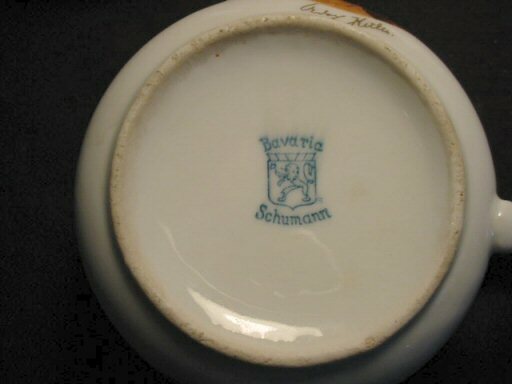 This was the contribution of the Schumann Company of Munich, Bavaria. 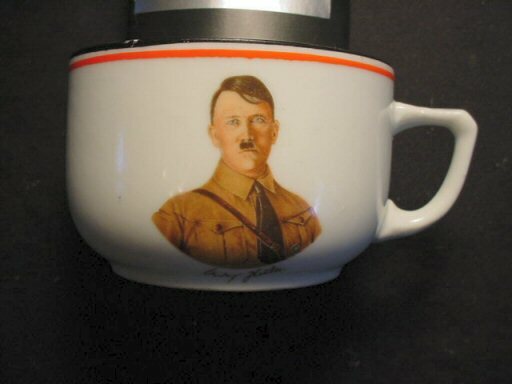 It is a really pretty little cup with a great depiction on color of the leader. 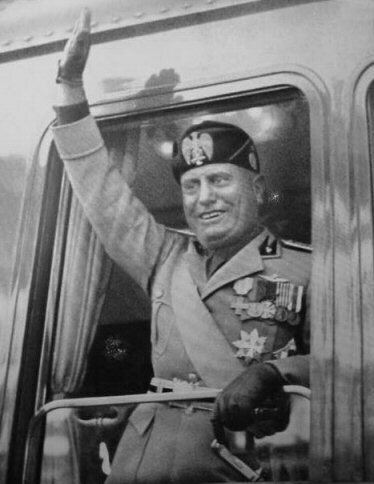 The face is particularly good and reflects the enthusiasm of his political agenda. The rim is colored black, white, and red; Germany’s national colors. The maker’s mark is clear with the rampant lion. It is 3 inches in diameter and 2 inches high. 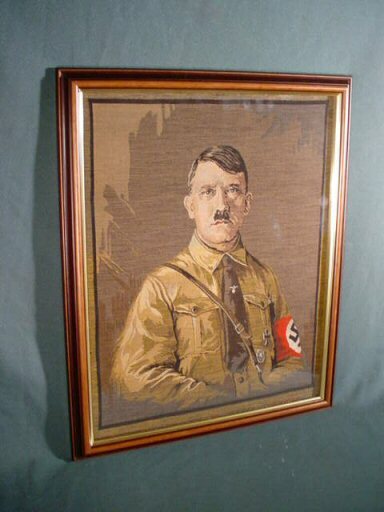 This is a genuine prize of a Third Reich patriotic item that was a treasured collectible, even in its time. 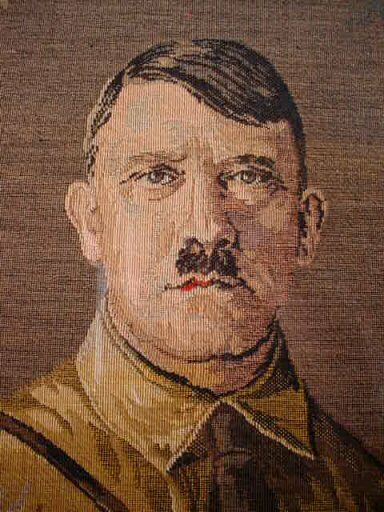 DESCRIPTION: Here is an actual period tapestry depicting Adolf Hitler in the uniform of the Deutsches Kampfzeit 1922-1933. 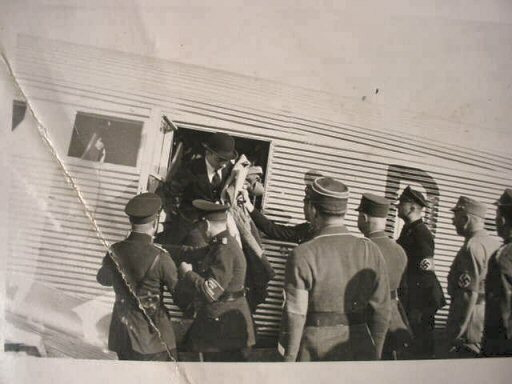 This was the time that the NS Party was in the greatest struggle. 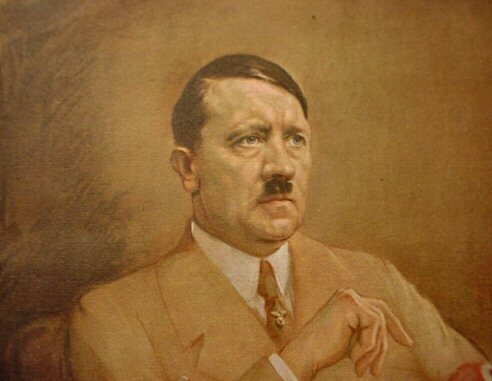 This is the young Hitler and the artist has captured all the leader’s youthful exuberance and ironclad determination. The manner of capturing not only a true likeness in this art form, but also the vibrant colors and treatment of fabric and accouterments is truly phenomenal. Seldom have we seen better. The shadowing is superb. It measures 16 x 20 inches in the frame. The actual tapestry is 14 x 17 1/2 inches. The frame is new, but in keeping with the type that would have been used. 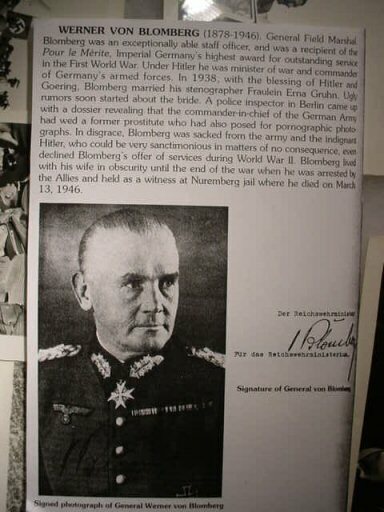 This is a fine historic treasure from the saga of the Third Reich. 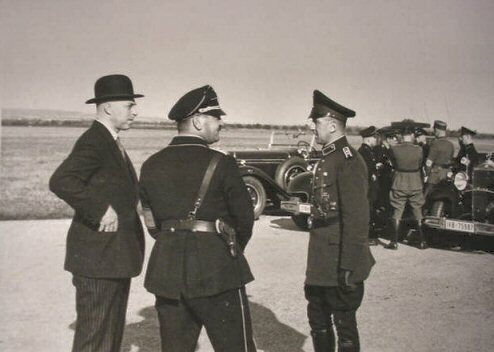 DESCRIPTION: This is an original picture (period) of the Führer in informal pose in the famous uniform of the Chancellor (prewar). It measures 6 3/4 x 10 inches and is in full color. 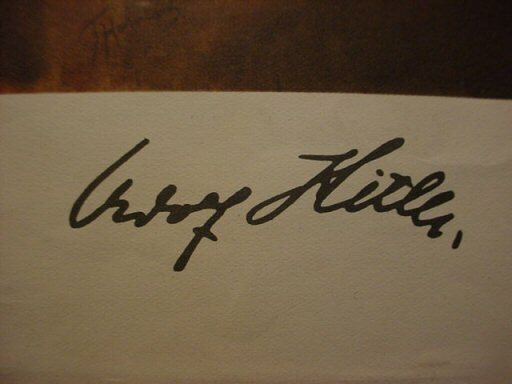 It has a facsimile of his signature underneath. 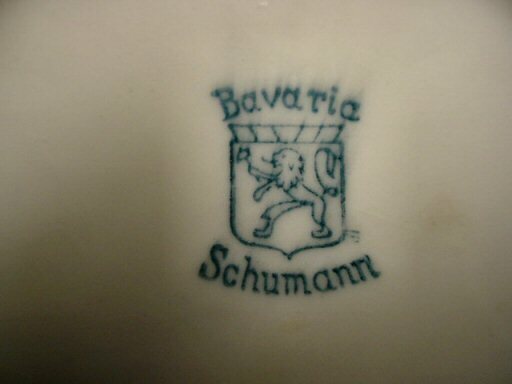 It was painted by M. Harnich of Berlin (Kunstverlags). 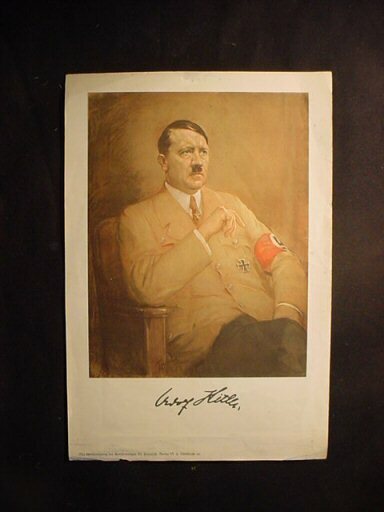 This would be a great item to frame since it again is completely original from the Third Reich era. Not a copy! 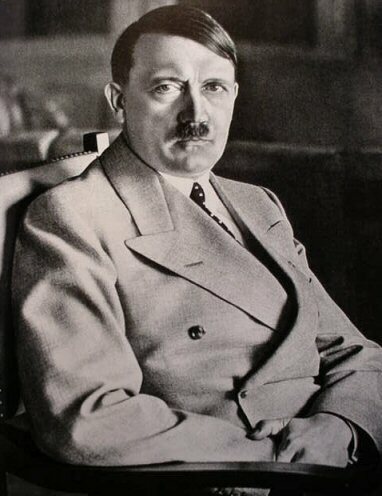 This is one of the best likenesses we have seen of the German Führer.